So What: Why does reflection matter? Reflective pedagogy transforms ePortfolio from a push-button technology into an engaging process of connection, linking students’ academic learning and life experience to the most profound processes of personal growth. As part of the CTLT Institute I had the pleasure of co-faciliating a workshop on Learning Portfolios with Tara Ivanochko an Instructor in Earth Ocean and Atmospheric Sciences and Director of Environmental Science. The workshop was a great opportunity to discuss examples of learning portfolios and their value in higher-education. If you did not have a chance to join us for the ELI Webinar yesterday, the following link will take you to an ELI archive page that includes an archive of the webinar and resources for the session. Join us at the next Portfolio CoP meeting for an interactive exploration of tools that can support portfolio assessment. What ePortfolio tools can meet your program needs? What new ePortfolio tools are available? What are the limitations of current ePortfolio tools? What are criteria for selecting ePortfolios tools? Join us on for an interactive exploration of tools that can support portfolio assessment. In particular we will be looking at three ePortfolio tools: The open-source ePortfolio tool Mahara, a platform that has been implemented in Higher Ed in New Zealand and Australia, WordPress a blog platform that has been customized and developed by a number of Universities to support learning portfolios. We will have a chance during the session to look at examples of ePortfolios using these systems, discuss possibilities and future directions. The Portfolio Community is open to anyone who has developed a portfolio whether on paper or in an electronic format. Seminars and resources are offered in response to expressed needs and interests of the community members; individualized assistance is also available. Members of the Community of Practice are invited to share their ideas, examples, resources and information about learning opportunities related to portfolios. Evidence-Based Learning in the sense of Evidence-Based Practice as pioneered in the field of medicine and psychology. 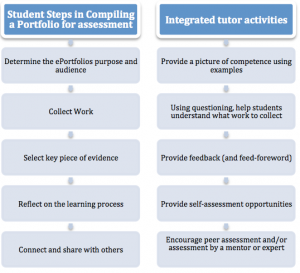 Portfolio Community of Practice: Assessing ePortfolios. This brief about ePortfolio assessment was developed to support and provide direction for the Portfolio CoP meeting held on November 7th, focussing on assessing ePortfolios. An e-portfolio is a purposeful aggregation of digital items – ideas, evidence, reflections, feedback etc, which ‘presents’ a selected audience with evidence of a person’s learning and/or ability. 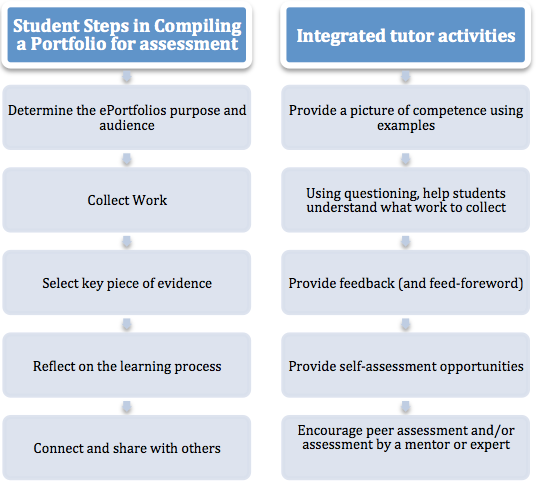 The portfolio provides a critical opportunity for purposeful, mentored reflections and analysis of evidence for both improvement and assessment of students’ learning. Such a process is a rich, convincing, and adaptable method of recording intellectual growth and involving students in a critically reflective, collaborative process that augments learning as a community endeavor. Portfolios dictate a different approach to evaluation: accumulation of work evidence and reflection on that work. Using reflection as the most basic way that we academics evaluate students is far more appropriate to the way we work in this century than the testing methods of last century. We no longer need to test as we did, but we do need to evaluate using portfolios. If universities are moving further towards an emphasis on ‘assessment for learning’ and formative learning then various approaches to paper-based portfolios and ePortfolios should naturally emerge across discipline areas. Miller, A. (2011). E-portfolios and E-assessment—discussions. During the Portfolio CoP meeting held on November 7, we explored approaches to assessing ePortfolios. As part of this discussion and sharing session Bernie Garret Associate Professor in the School of Nursing and Andrea Webb instructor in the Faculty Certificate Program discussed approaches that they have taken to assess portfolios and ePortfolios. Andrea Webb discussed how ePorfolios are assessed in the Faculty Certificate Program (FCP). The faculty certificate program is a one-year program focused offered for faculty leaders at the University of British Columbia. As part of this program participants develop a learning portfolio using the Connect Wiki tool, which is used to showcase and assess their learning. The program has adopted moved the learning portfolio online recently and Andrea discussed some of the assessment strategies used in the program. Formative check-in: A formative check in with course instructors. Bernie Garrett, discussed different ways that ePortfolios are used in the school of nursing and the different approaches and strategies used to assess them. The PEP Portfolio was developed to assess the clinical skills of undergraduate nursing students. The PEP includes functionality to allow clinical supervisors to assess clinical skills through observation. It also allows students to create learning plans, and reflect using learning journals. Bernie Garrett also discussed graduate nursing ePortfolios that are developed using the Blackboard Learning management system using the built in blog tools. He noted that with these ePortfolios he used formative and summative check ins. Considerations in determining the extent that ePortfolio artifacts are selected by students or our mandated by the institution or program. It was noted that that highly structured ePortfolios are effective at providing valid assessment and for gathering data about student learning, however they tend to take away from the ownership and creative ways that students can create artifacts and develop their ePortfolios. Tartwijk, J. van & Driessen, E. W. (2009) Portfolios for assessment and learning: AMEE guide no. 45 Medical Teacher. 31: 790-801.